IF YOU’RE THE type who goes to bed wearing your work clothes to save time in the mornings we think we know what kind of breakfast you’re after. You won’t be the type to stew over the thickness of the hollandaise sauce for the eggs benedict but rather the gone in 60 seconds type. Thankfully, the advent of blenders has facilitated this lifestyle and provided you’ve the following ingredients placed in it overnight there’s no reason you can’t go from bed to pavement in this time. Press ‘on’ and you’ll be good to go in less than a minute! 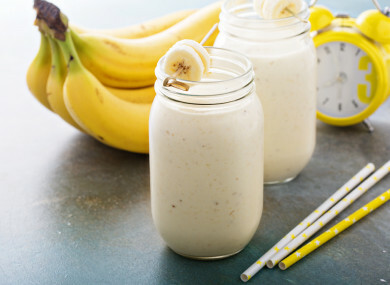 This breakfast smoothie isn’t loaded with the sugar content of many others, you’ll kick-start your metabolism, replenish your energy stores and possibly even keep you away from the vending machine until lunch. Email “Stuck for time in the morning? This 5 ingredient smoothie will set you right ”. Feedback on “Stuck for time in the morning? This 5 ingredient smoothie will set you right ”.